Mamie has combined her love of CrossFit and lymphedema advocacy in a fundraising event! Submitted by Mamie F., August 2012. It seems my story is very similar to others that have primary LE. My symptoms presented at around 24. My legs swelled horribly from the knees down. My doctor did not think much of it and attributed it to a venous problem. After about a year of complaints I finally got a sonogram of my veins – all was fine and then panic set it. I had every test possible and no one could tell me anything other than I was fine. I was finally diagnosed at 27, 3 years after the onset. I call that my JFK moment, I remember everything about that moment. I never thought that what I had would be with me forever I naïvely thought that once I figured out the issue I would pop a pill or get surgery and be fine. The most frustrating thing is the lack of knowledge there is about the Lymphatic System and related complications. I also find that most people don’t get it. The reaction is – so you swell a little no big deal. But we all know it is more than that. There are major self-esteem issues, discomfort, and not knowing what the future holds are all part of dealing with this condition. Like everyone else I have my days where I feel sorry for myself but for the most part I look at the bright side. Going through this has made me a more empathetic person, a stronger person, it has also forced me to take responsibility of my health. I am a Crossfitter and that is pretty much what I do in my spare time. Crossfit is a high intensity program. It’s not only a great way to stay in shape, the community is incredibly supportive. 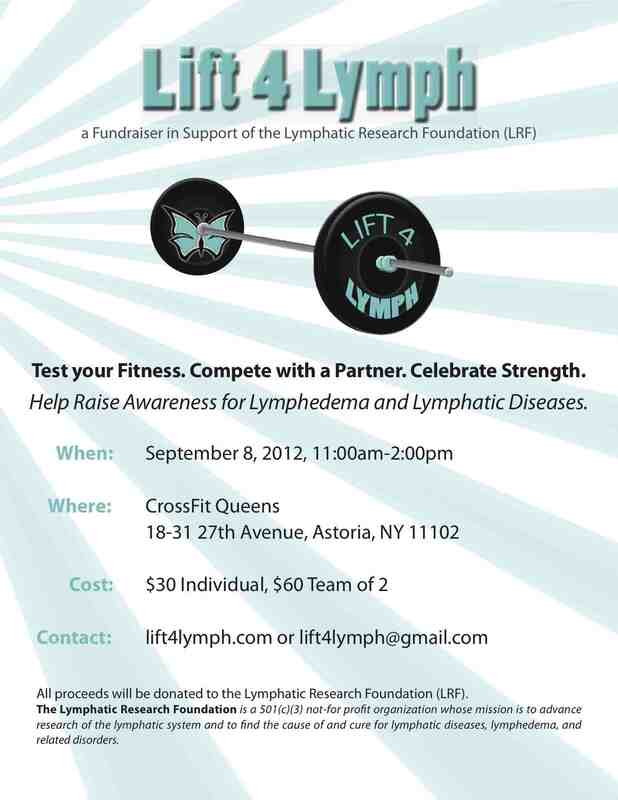 On September 8, I am hosting a fundraiser for the Lymphatic Research Foundation (LRF). The event will involve a Crossfit Competition and participants will pay to participate. The winners will receive prizes which have been donated by local businesses and even some that have a farther reach. Information about the event can be found at www.lift4lymph.com The event is open to all and I would love to have some lymphie folks out there. Click the image to enlarge the flyer. This has truly been a labor of love for me. I feel that planning this event has helped me come to terms with this condition. I want to be as involved as I can be in supporting the community of people that suffer from this condition. I was inspired to do this after watching Deborah Carson, a fellow Crossfitter, make it to the Crossfit Games and place 13th. The games are like the Olympics for Crossfitters. She inspired me, so I want to pass it on. Submit your story to the Lymphie Life! Use the contact form here to share your personal story of living with lymphedema, and, with your permission, it’ll be posted on the website. It’s very admirable what your doing, Mamie! Although, I live in NYC, I’m not sure if I can attend because I volunteer with kids in a hospital on Saturdays. I’ll leave a donation if I can’t attend. Thanks Rosie! Would love for you come out. Feel free to contact me. I think I’ll be able to make it, after all. Looking forward to meeting you soon!